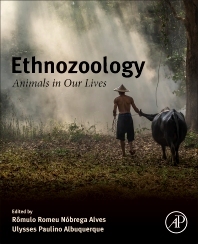 Ethnozoology: Animals In Our Lives represents the first book about this discipline, providing a discussion on key themes on human-animal interactions and their implications, along with recent major advances in research. Humans share the world with a bewildering variety of other animals, and have interacted with them in different ways. This variety of interactions (both past and present) is investigated through ethnozoology, which is a hybrid discipline structured with elements from both the natural and social sciences, as it seeks to understand how humans have perceived and interacted with faunal resources throughout history. In a broader context, ethnozoology, and its companion discipline, ethnobotany, form part of the larger body of the science of ethnobiology. In recent years, the importance of ethnozoological/ethnobiological studies has increasingly been recognized, unsurprisingly given the strong human influence on biodiversity. From the perspective of ethnozoology, the book addresses all aspects of human connection, animals and health, from its use in traditional medicine, to bioprospecting derivatives of fauna for pharmaceuticals, with expert contributions from leading researchers in the field. 13. Animals and Human Health: Where Do They Meet? Rômulo R.N. Alves is a biologist (Ph.D. in Zoology, 2006) with a keen interest in the connections between humans and animals. His areas of academic interest are ethnozoology and wildlife trade, uses and conservation, zootherapy, and human ecology. He has conducted ethnobiological research for the last ten years, which focuses on ethnozoology, particularly on fisheries, hunting, and wildlife trade and uses. As a result, he has published (as author or co-author) more than 150 scientific papers published in both national and international journals, 7 books and more than 50 book chapters. He coordinates projects on hunting and uses of wildlife in Brazil. In addition, he is one of the Editors-in-Chief of the journal Ethnobiology and Conservation and member of the Editorial Board of the Journal of Ethnobiology and Ethnomedicine. He also holds a Productivity scholarship provided by the National Council of Science and Technology (CNPq).